Big news came out yesterday with all-new teams on the Green Lantern books, but while we wait for those, let’s check out the fine noob-friendly comics for this week. Aliens, sticks, guns, swords, and more populate the books being examined, and I don’t think a single one was bad. So, without further ado, let’s jump into some Comics for Noobs! Mark Waid, Chris Samnee, and their run on Daredevil have been nominated or received just about every comic award imaginable, so it’s no stretch to say that this is a book you should be reading. If you’re a new reader, you’re in luck! With this issue, Waid starts a fresh arc of what has been a storied run of the series. Matt Murdock’s best friend and business partner Foggy Nelson has had some health problems recently. Even though the two have had some spats, they’ve came together in the hard times. Matt is making sure that Foggy has some great memories before he gets his test results, so he takes Foggy on a night with Daredevil. While the two are out, some supersensitive criminals crash a party and Daredevil has to stop them. The next morning, Matt meets Foggy at the doctor for his less than positive test results. 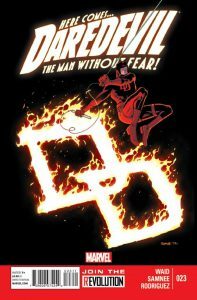 Waid’s run on Daredevil has been praised for taking the character back to street-level. He’s no longer fighting world-class threats, but he’s having truly meaningful adventures. Matt’s forming relationships with people and being there for them when they need him, while also atoning for past sins. This coupled with Samnee’s often shadowy art, has made Daredevil a hit. The first few pages of this issue tell Daredevil’s origin story while also adding to the overall plot of the arc, something that is rarely done well. It’s a perfect issue for any new reader who wants in on an award-winning series. Parental Concern: Minimal. Violence with a couple of less than great images. I was never much into GI Joe as a child, but I’ve always been aware of them. They’re the first thing that springs to mind when most people think of action figures and have become a big cultural entity. With the beginning of a new volume of the comic lore, I couldn’t think of a better time to get into them. The GI Joes have ceased being a covert team that stop terrorist threats and have now been revamped as a government sponsored anti-terrorism squad. Members of different service branches, races, and genders are assembled to take part in the first public mission. When the mission goes wrong, one Joe is left seemingly dead, another seriously wounded, and the group separated. I really enjoyed what Fred Van Lente, Steve Kurth, and Allen Martinez did with this issue. As someone who has never read a GI Joe comic before and isn’t particularly well versed in the universe, I didn’t feel at all left out. 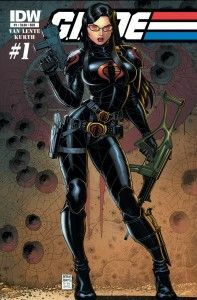 It didn’t so much feel like a GI Joe comic as a great action comic whose characters just happened to be GI Joes. A fun introduction to the series and overall universe that is sure to draw in some new readers. Parental Concern: Moderate. Violence and language. 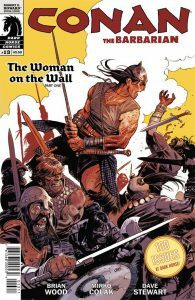 Brian Wood, in his apparent attempt to write as many different genres as possible, has had a stellar run on Conan. Mirko Colak is only the latest fantastic artist to help create the world of the savage Cimmerian and his vicious battles. Conan and Belit have parted ways. Belit miscarried their child and is left with a sense of loss that prevents her from returning to her former life of conquest along her Cimmerian lover. Conan is left to either move on or find Belit. When he decides to go search for her, he’s conscripted into the army of a nameless king on his way to a pointless war. A war that Belit just may have something to do with. Wood crafts an issue that has little actual dialogue, but is heavy on the narration. Colak’s art helps tell Conan’s tale of desperation and sadness as he loses his love and learns that she may not be coming back. The lack of dialogue works well for Conan, as he’s a man of action, not words. When he does speak though, it’s truly something meaningful. The narration provides enough insight into past issues to keep new readers up to date, but also encourage them to seek out the past stories. A wonderful time to jump into this book. Parental Concern: Minimal. A bit of violence. While Superman, Batman, and the rest are busy with their adventures over in Justice League, an entirely different cast of characters are teaming up in this new title. Geoff Johns will be shaping the DC Universe with his work on this series. The US Government is a bit uneasy about the Justice League. Beings as powerful as Superman and resourceful as Batman need to be somehow kept in check in case they ever go rogue, they feel. Their answer is to assemble a team of their own, one that will be sponsored by the government. This team will help out the other superheroes, but will also take them down if the need ever arises. 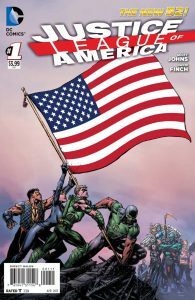 Hawkman, Simon Baz, Martian Manhunter, Catwoman, Vibe, Katana, and Stargirl make up this new Justice League of America. Initially, I was extremely skeptical about this comic, but pleasantly surprised. The idea behind it, a sort of superhuman countermeasure, is interesting to me and the cast of characters could make for an interesting read. The fantastic art by David Finch only helped to add to the overall quality of the book. Definitely one a new and curious reader could and should pick up. There you have it! Of course these are just the opinions of this lowly reviewer, but I think the comic community at large will agree with me about these books. What is most definitely true is how great a time it is to be a new comic reader with all the fantastic new stories being made each and every week. Check back next week for even more!